Get your Mexican Insurance Policy in Just Minutes and be on Your Way! If you are traveling into Mexico, you are required by law to have Mexican Automobile Insurance. If you have an accident in Mexico, things are handled different than in the US. In Mexico an accident means facing a local judge who determines fault. If you are found guilty you will be held until you can show proof of your ability to pay for the damages caused. In some cases this can mean jail time. If you are a driver who purchased quality Mexican insurance you will immediately be able to demonstrate liability coverage which demonstrates your ability to pay for the damages. You will also have legal assistance coverage which will give you legal representation and bail bond. So don’t risk the possibility of incurring any fines in Mexico or worse yet, jail time! and Get Mexican Insurance. Every year Mexico puts into effect stricter laws for uninsured motorists. You need good quality Mexico Insurance, not having it can cost you money due to damage/loss to your vehicle, fines and more. We offer you several options to ensure you get the best coverage at the best price. You will be able to choose from several insurers and programs all A rated by AM Best. Purchasing a Mexican Insurance Policy is easy! Actual Cash Value of your Vehicle. If you’re unsure of the cash value we recommend you go to Kelly Blue Book or the NADA Guide to determine the value of your vehicle. The exact dates you will be traveling into Mexico and coming back and the time you expect to be crossing the border on your way in and on your way back. – The cash value of your vehicle. We suggest using either the Kelly Blue Book or the NADA Guide to determine the value of your vehicle. – How much time you will be spending in Mexico. – Whether you need to purchase physical damage and liability, or just liability alone. You also have the option to chose from 6 month policies and Annual policies. If you would like to purchase liability ONLY a Drivers License policy may be something you would look into if you will be driving different vehicles in Mexico. Ask one of our agents and we will help you find the coverage that will work best for you! We have been selling Mexico Insurance for over 20 years, all of our insurers underwriters are A rated by AM Best and our agents have insured thousands of satisfied customers over the years. Four of our Mexico Insurance online underwriters, El Aguila, GNP, ABA, and ACE Seguros offer coverage package endorsements not available anywhere else in the Tourist Auto market. These packages offer extended coverage, for an additional price, that are not available from anyone else in the market. To learn more about these Mexican insurance packages, please click on the “Explain” button on our quote results page. Up to $500,000 Combined Single Limit Liability for Bodily Injury. Up to $75,000 in Medical Payments, for you and your passengers. Collision, Fire, and Natural Disaster. Optional Fixed Deductible. Having Mexican Automobile Insurance is just a plain good idea. 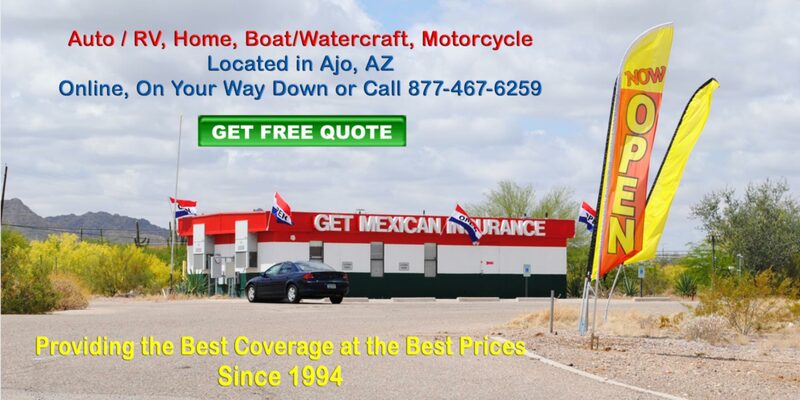 You can now Get a FREE quote or a Policy right online without even having to talk to anyone, or if you want, give us a call and we’ll gladly process your policy and email it to you or if you prefer you can pick it up at our office in Ajo, AZ on your way down to Mexico. We Can Fax, Email, or Regular Mail out your policy within minutes of preparing your policy. If you have your Vehicle Identification Number (found easily on your registration) and your Plate Number. In most cases we can process you Policy in just a couple of minutes! ∗ GNP includes natural phenomena as a Section II Peril increasing the deductible to $1,000 for losses related to flood, hurricane, etc. ∗∗ Motorcycle insurance policies DO NOT include medical payments for any drivers or passengers.